My journey following the travels of Burke & Wills has resumed. Last year I reached their depot camp at Menindee and turned south because it was too hot. Having just started the trip with 8 °C outside there is a danger that I will head east to the coast for some warmth. Today I travelled over areas I visited last year so not much to report. But I did visit Camp 8 this time on the Campaspe River at Barnadown near Lake Eppalock. 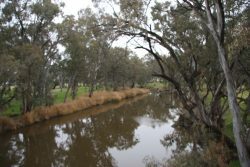 The photo shows the river and where Burke and Wills Camped. They crossed the river in Kennedy’s punt (Kennedy owned the Barnadown pub near the river so he made money taking people to and from his pub across the river and also selling them grog). You can figure that the Kennedy’s originated in Scotland. One of Burke and Wills camels died just after crossing the river and some contend that this is when their bad luck started. 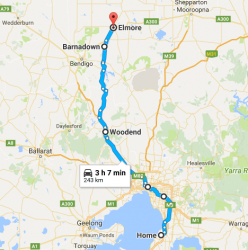 On the way I visited Woodend (6 °C) to see Marg’s brother Barry and his wife Cas, who had just got home from hospital. An enjoyable visit and good to see Cas in better health, but still recovering. 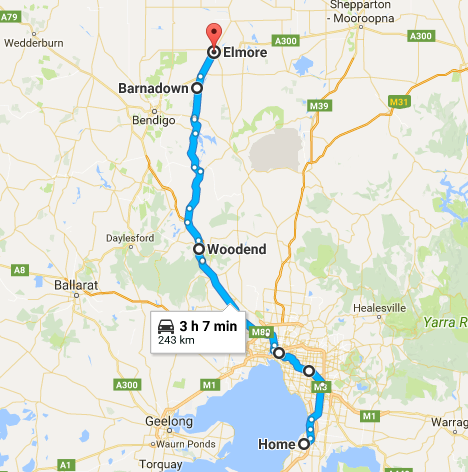 Tonight I have stopped at Elmore Caravan Park, not much of journey today, but I have plenty of time. Great to read about your journey. I’ve read a great book called “The Dig Tree” about the wonderful, frightening tale of Burke & Wills. I remember that Menindee was the point at which things started to turn sour. I’m glad you saw Barry and Cas. Did you know that we have Kennedy heritage in the Incoll family? So maybe we are predisposed to the grog too? Keep enjoying your intrepid journey in the chilly winter. Thanks David. I read the Dig Tree as well, it is a good book. Things went wrong at Menindee because Burke split the expedition and was not clear about leaving Wright in command. So Wright waited to get confirmation from Melbourne which delayed them leaving for Cooper Creek for months. Burke then made things worse by splitting the group again, and he didn’t take enough supplies by not accounting for needing more per day on their return. I have a book “Following Burke and Wills across Australia” which covers their trip in more detail but is geared for people following the journey. I am aware of the Kennedy ancestry, Mum was very proud of it especially Sir James Kennedy MP, hence my middle name.